A mixture of mid-century modern flair and a traditional design combine to create the Matilde Sofa. 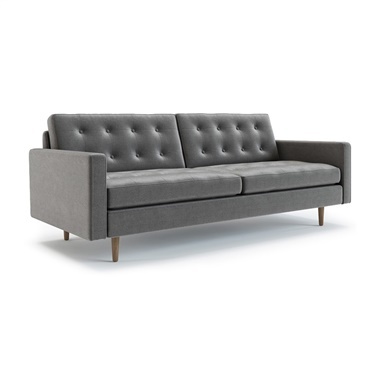 With classic lines and a streamlined silhoutte, it features a single seat cushion and modern block style tufting. Dual back cushions and round bolster pillows offer ultimate comfort. Available in your choice of color, the Matilde Sofa boasts walnut stained legs, which provide ample support and style. Luv the color and velvet material. A little deeper color than in photo. Based on reviews would have thought cushions were a little softer and more comfortable. Very hard. Paid extra to have piece checked for damages. Received with black spot on arm. Fortunately not noticeable in current room. However disappointing. I'm not sure if I want to purchase additional items now. SOFT AND SMOOTH! The design isn't half bad either, looks fantastic in my living room, love the velvet! Ordered in copen blue!! OUTSTANDING COLOR & EXTREMELY COMFORTABLE! Took a leap of faith with the spring green and I like it! It's on the lighter side so it brought out some of my darker greens accent pieces, it's an exceptional choice if your know how to work with colors and it turns out I do! This was sort of my introduction into the interior design world and I am thrilled I went for it! Emerald green is a fantastic choice, without a doubt the best sofa purchase i've ever made! something new and in style - a big and much needed change! Copen blue upholstery and block style tufting on seating was a real change from my old boring sofa, the thing was so old fashioned it actually has an attached frill skirt - I was getting so sick of looking at that raggedy thing, it's really nice to see something new and in style in my living room! 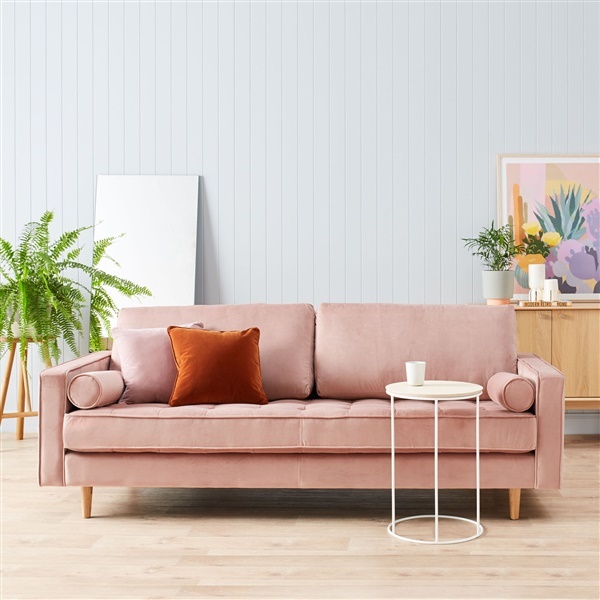 Blush velvet sofa looked completely different in natural light in comparison to artificial light. I was actually shocked when I saw the difference in my living room especially since I was color coordinating it based on similar colors found in my rug and other living room decorations. Fortunately, both shades look nice and the darker look to the fabric with artificial lighting offers a more dynamic style alongside the similar (although lighters) colors. It all worked out but I recommend asking for color samples in the color you want beforehand to see the comparison and to be sure it works in your space. Softest and smoothest sofa I've ever felt!! Unbelievably happy with my purchase - already knew I would love the look from the photos but to the touch it blew me away! THANK YOU! Tufting on seat cushion is a fantastic touch! The velvet and bolster pillows give it this luxurious feel while the rectangular armrests and frame create a very orderly and contemporary look - its a great combination especially for my living room! I came home to find my brand new sofa all set up in my living room! I am incredibly happy with my order. It is the perfect size, the velvet upholstery is smooth and soft and the cushions are comfortable. I recommend this sofa to everyone! velvet is the way to go! First time purchasing velvet furniture, its incredibly soft and comfortable, it makes me feel like royalty when i lounge around on it!! I don't think i'll ever go back to any other fabric!! ordered in sapphire blue and it is exquisite!! The velvet upholstery is luxurious and I just can't get over the vibrancy of the color! love it! We got ours in sapphire blue, it is vibrant and stunning. The velvet is super soft and comfortable. I love this sofa! Do you know the material of the frame, how is it made? The Matilde Sofa is made of a Hard wood frame construction, Sinuous spring system with elastic webbing, and Solid Malaysian oak tapered legs finished in a walnut stain. Do you make delivery abroad (France) ? We do offer international shipping, at an additional cost. Many times the cost of international shipping is not cost effective, as the costs are oftentimes more than the cost of the item itself. What foam does this sofa use? Latex? Polyurethane? High resilient? Or? Are chemicals used to make this sofa? Any flame retardants? The Matilde Velvet Sofa is made with a firm polyurethane foam and is made without the use of VOC's or flame retardants. im looking for microsuede fabric so it's kid friendly and easily washable - is that what this is? The Matilde Velvet Sofa is upholstered in real velvet, rather than a microsuede. If you would like to see a swatch of the velvet material, you may email your request to [email protected], and we will be happy to send a sample of the material to you in the mail, free of charge. Is the blue color true to the picture? I like how it looks more muted. The description says sapphire blue which makes me think it could end up being brighter. We recommend ordering a swatch sample of the material, as there can be computer monitor variances. To request a swatch, free of charge, you may send an email to [email protected], with the name of the item, the upholstery color you would like to see, and your mailing address.